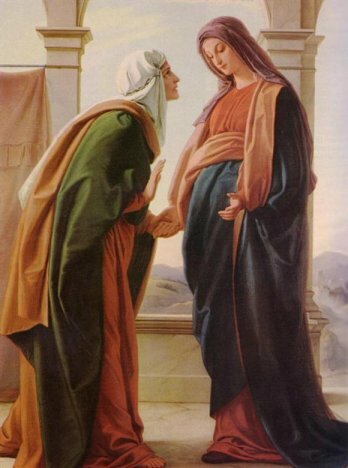 Mary: "My soul proclaims the greatness of the Lord"
Today Mother Church celebrates the feast of the visitation of the Blessed Virgin Mary, who, while pregnant with Jesus, travels to see her cousin Elizabeth who is at the time pregnant with John the Baptist. As soon as Mary approaches, John the Baptist, inside Elizabeth, jumps for joy because he knows that he is in the presence of the Son of God! Elizabeth knew it, too, and of course was the first to call Mary the Mother of God. It’s a beautiful prayer in which Mary praises and thanks God for the gifts he has given to her. It is a prayer of rejoicing on account of the greatness of a God who lifts up the lowly through his saving power and mercy. One could go on and on about it. The Magnificat if of course recited every day (except during the Triduum) during Vespers, quite fittingly. Therefore it is an excellent and fruitful custom of holy Church that we should sing Mary’s hymn at the time of evening prayer. By meditating upon the incarnation, our devotion is kindled, and by remembering the example of God’s Mother, we are encouraged to lead a life of virtue. Such virtues are best achieved in the evening. We are weary after the day’s work and worn out by our distractions. The time for rest is near, and our minds are ready for contemplation. Do our souls proclaim the greatness of the Lord? This entry was posted in Liturgy, Mary, Reflections, Saints. Bookmark the permalink. ← "We are lost. We have burned a saint."